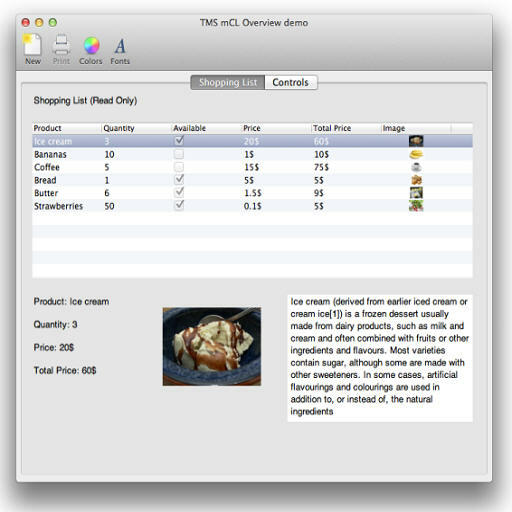 TMS Software offers a set of 100% native Mac OS-X components for FireMonkey applications. The set includes a tableview component with rows/columns and lots of features, customizable toolbar, image component with support for TIFF, JPEG, GIF, PNG, BMP, ICO, CUR, XBMs, a PDF file viewer, ThumbnailView that can be connected to PDF file viewer for page selection via thumbnails, a button with many built-in styles, edit control with perfect integration with the operating system, a label control, level indicator with min/max/tickmarks, bar or circular progress control, tabview, popover control, datepicker as calendar,clock, a edit control, combobox control, up/down control with min/max and normal or continuous step mode, a radiobutton control, checkbox control, multiline edit control, scrollbox, embedded Safari webbrowser, and a horizontal/vertical/circular slider control which can be mixed with FireMonkey graphical controls used directly on the form. Te entire component set comes with a full set of demos and an extensive PDF developers guide. Stop on by and see their full component list and pick yourself up a copy.